After an awesomely challenging fall series of Cannonball gravel races; we now focus on the winter Cannonball series. This series is for those who like a little unpredictable adventure with their gravel experience; will there be snow, ice, mud or maybe even all three. Will the ferry make it across the Mississippi, will you make it all the way till the end; keeping it real adventurous, it’s what we do! Sign up for both races of this series and save! $70 gets you entrance to both races, awesome food and drink after each event, and an awesome stainless finishers flask! As you likely know from before Cannonball Gravel Races are epically fun cycling races, held on open roads, completely self-supported, utilizing GPS for navigation and Strava for timing/scoring. No traditional timing clock, no corner marshals, no closed courses; just you, your bike, and your honor. The first Cannonball race will take place from the St. Nicholas Landmark located in Chester, Illinois on the 2nd of February, Race Start 9AM, Registration Open 8AM. The Chester Police Department will once again shutdown the bridge across the Mississippi for our ride launch, and yes, the ferry will be in play again for this one. We will have a long course with 67 miles and ~2,000’ of up and a shorter course with just under 45 miles and only ~1,500’ of fun. You can register here today for $45. 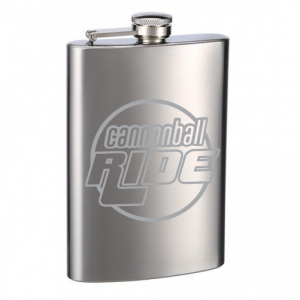 Or Double up and SAVE and get in on a Cannonball Finisher Flask. ROUTES are FINAL We are using the alternate as the Ferry is still offline. Start time is 9AM at the St. Nicholas Landmark in Chester, IL. Registration will open at 8AM at the Landmark. The new finish will be the gas station just west of the Chester bridge, where you will be met by one of our vehicles and transported back to the Landmark for post ride festivities. The second Cannonball race of the winter season will happen February 16th. This course from Sauget is nice and flat and if anything like last year, super exciting! We will be rolling from the same spot as last year, the Sawmill BBQ joint, and they will be serving us a great BBQ lunch when we get back! Registration opens at 8AM and the race rolls at 9AM. The course this year is ALL NEW! This will be one of the fastest gravel courses ever with less than 500’ of elevation on the new 49 mile long course and only 200’ on the shortest course of the year, at just over 27 miles. These new courses avoid all of last years “problem areas” and we have been able to roll up the gravel percentage too, 70+% for the long route and over 85% for the short one. Both routes roll out together and split apart at mile ~20 where the short turns back. We will have the overall awards ceremony for the Cannonball Winter 2019 series at Sawmill in the early afternoon, after most are back and have grabbed lunch and a drink!